Brushing teeth in my house is something I’ve made fun for my sons since they were little. When the boys were just starting to brush on their own, they saw brushing their teeth as a chore. It was something I “made” them do every morning and every night. It wasn’t something they actually looked forward to. They didn’t fully understand that I was trying to keep their teeth not only clean but healthy. I wanted to avoid cavities and unnecessary trips to the dentist as much as possible, so I knew starting young was important. The task of brushing teeth was something I made into “fun time,” both in the morning and at night, and the boys started to love it. Making it fun was the only way I knew to get them to do it consistently without putting up resistance. I needed to ensure they were getting in brushing time and that they were doing a good job. I didn’t want them just putting the toothbrush in their mouths for 10 seconds and being done! 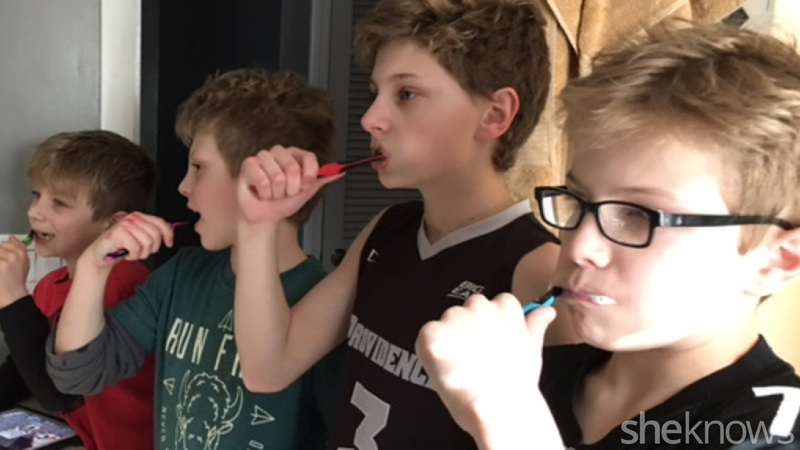 My sons are a bit older now — 7, 8, 10 and 11 — but I still make sure I keep brushing teeth time fun for them. It’s something they’ve grown used to and have even come to expect. Musical toothbrushes: We have a radio in the bathroom, so I’ll turn it on and make them brush to a song. When I turn the volume down, they can stop. When the volume is up, they brush. It allows me to see that they are actually brushing and getting their teeth clean. I will keep the music going for 30 seconds, stop… go again for 30 seconds, stop… I keep it fun, and it keeps them on their toes! Who has the shiniest teeth? Oh, yes — never underestimate a contest between brothers! This has worked for me many, many times. The boys will brush their teeth, and I will have a “prize” (usually something small) for the boy with the shiniest teeth. You should see how good they brush! They really take the time to make sure every tooth is clean and that they have a sparkling smile! Musical-instrument teeth: It’s fun to play the game that your toothbrush is a musical instrument! You can play “toothbrush band” — my sons love pretending their toothbrushes are guitars going back and forth on their front teeth. Or drums going pitter-patter on their back teeth. It’s all just a good way to make brush time FUN! Mystery toothbrushes: I do this once every six months. I’ll buy new toothbrushes for the boys, show them what they look like and then put them in a bag and let them guess which one they’ll pick. It’s like a fun grab bag! They get excited over it as they hope they get a certain one. Then, of course, at the end, trading happens!! Timer Time: Take a timer upstairs to the bathroom and set it for everyone. See who can brush their teeth the best in two minutes, and you being the judge. Make sure the job gets done good and thorough. It’s funny seeing how fast they go without dilly-dallying! It’s a great thing to do every now and then as a game. As always make sure you’re prepped with a great toothpaste. ProNamel® 6-12 Years Toothpaste for Kids is used to actively strengthen the precious enamel kids have. The company’s kids line is focused on kids age 6–12, who are in the stage of losing their primary teeth and growing in their secondary ones. Due to diet, kids can experience Acid Erosion of their enamel — and once it erodes, it never grows back. As they’re brushing and having fun, you know a good job is being done, too!